Perched on the top of Melbourne Central, this architectural oddity houses a warm bathing experience for six audience members at a time. Bring your best swimwear to find reprieve from the always accumulating junk-space that thrives below. Aussie work wear and haute couture collide on Melbourne streets – a performative installation using powerful industrial sewing machines and tightly tailored orange vests, to consider masculinity. You will be picked up and taken on a journey to the new frontier of understanding. The surprise venue is extraordinary, and this important collective of artists have created a powerful combination of new media, sound and live performance to explore. 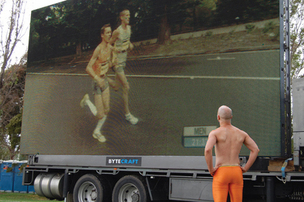 A durational performance of excess and spectacle looking at our fitness obsessed culture. Tristan Meecham will run for five hours on a treadmill whilst over 200 sports people perform around him at city square. Watch him attempt to control the situation as his the sweat starts to pour breathing gets heavy. as you watch from windowsills far above the street, a ‘self-help’ audio guide will take you on a musical journey through the things we tell ourselves to make us feel better. A work about what we have witnessed and what we choose to believe it might have been. Artists take over the MCG! Enough said. Bennet Miller will construct a scale replica of a former U.N. office in Switzerland, at the Melbourne Museum plaza. Each Saturday afternoon, this structure will play host to a meeting of the U.N.’s Commission on Human Rights, wherein all 47 of the national delegates are live dachshunds, or ‘sausage dogs’. Other works to look out for: And Then Something Fell On My Head: Live Choreographed fallings objects, I’m Fine: site-specific response to a mental health centre, Sugar Coated, Explicit gendered performance by visual artist Hannah Raisin, Dangerous Melbourne ‘community information evening’ by Paula Van Beek.